There is no rule of grammar, of which I am aware, that bans the splitting of an infinitive. The “never-split” school of thought posits that the infinitive form of a verb is “to” immediately followed by the verb stem. 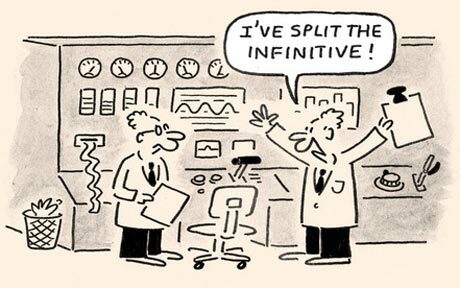 Therefore, splitting an infinitive is destroying the verb form. The coupled pair of words should never be separated: never ever! The “OK-to-split” school of thought says that there is no syntactical rule that forces “to” to always be next-door-neighbors with its verb stem. As a matter of rhetoric (rather than as a matter of grammar), a split infinitive can sometimes be marginally more communicative, as in the famous Star Trek intro, “To boldly go where no man has has gone before.” Moreover, we split other verb forms, like the progressive and the perfect tenses; why not infinitives? We can say, “He has always gone to Boston,” so why can’t we say “He likes to always go to Boston“? It’s not pretty, but is it wrong or illegal? 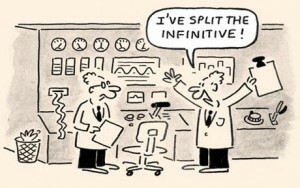 Split infinitive alert! Line 12! Personally, I side with the “OK-to-split” crowd, in part because English is the only language (of which I am aware) that has a two-word infinitive form. This issue does not come up in other Western European languages at all; so English can expect no guidance from its neighbors. And the fact that we split lots of other verb forms without batting an eye is persuasive to me. 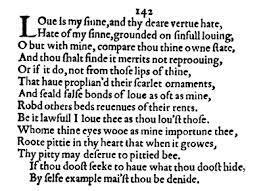 Finally, Shakespeare wrote in Sonnet 142: “Thy pity may deserve to pitied be.” Yes, I know the Bard often took liberties with our native tongue, especially when he needed a rhyme; but if he can do it in a sonnet, I can surely do it in prose. I draw the line, however, when the insertions in between “to” and its stem become so protracted that it is hard to follow the syntax of the sentence. In other words, it surely is not recommended to, in a manner of speaking, and with no concern for clarity of content, make a cavernous split in an infinitive. Those in the “OK-to-split” group do not usually have strong feelings about the subject; that is, they do not insist that you split your infinitives. On the other hand, the “never-splits” have rigid opinions. Now, good writing should stand in the background from its content; that is, it should be invisible to the reader. This allows the message to sink in without any competing distractions from the method of expression. Therefore, the safest policy is to follow the practice of the “never-splits” — not because they are right (as I do not think they are) — but because they have strong feelings on the subject. The rest of us do not.